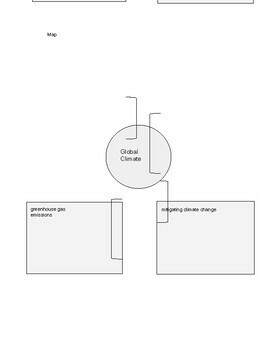 Global Climate Introduction Using K-W-L Strategy!! 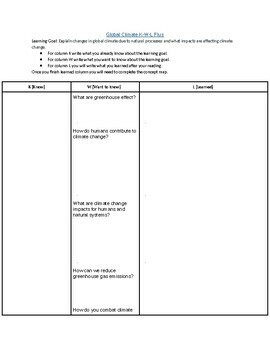 This is an activity I use for an introduction before starting global climate unit. 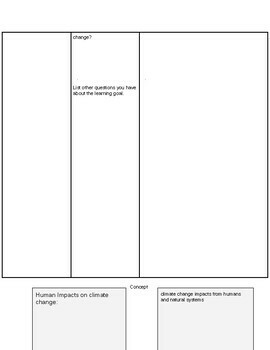 This strategy allows students to express what they already know about the learning goal, what they want to learn and then they read a text about global climate. The text the students need to read is linked in the word document. Includes word document of K-W-L columns and an example concept map students can use to create their own. "editable"
Learning Goal: Explain changes in global climate due to natural processes and what impacts are affecting climate change. For column K write what you already know about the learning goal. For column W write what you want to know about the learning goal. For column L you will write what you learned after your reading. Once you finish learned column you will need to complete the concept map.